Want to be better at painting but don't know where to start? You're not alone in this feeling. The truth is that art is inseparable from confidence, and you will not be able to create until you believe that you can. It's a tough catch-22. Hopefully this video will help! And make sure to check out Andrew Jones' artwork, as well as Noah Bradly's Blog post for great inspiration! As an artist it's worth considering film for more than it's entertainment value. PaintFlix is an ongoing series about beautiful movies found on Netflix streaming. These movies don't always have good stories, and I wouldn't fault you for watching them on mute. Bottom line: at $8 per month, Netflix streaming is a fantastic source of visual inspiration and I'd love to help with movie recommendations. Are you a Star Wars fan? This is for you. Sure, this movie was a technical achievement for its time - but more importantly it is a sci-fi animated feature. Animated feature: period. As in...not strictly for kids. As a result the environments and themes are a bit grittier than your average animated children's movie. The "Color Story". Animated movies are great at using color to push the emotional undertones of their narrative. Since every color was painted by an artist, and not captured by a camera, it's all intentional. Make sure to see how each scene uses color to hammer home the current emotion. The Backgrounds. 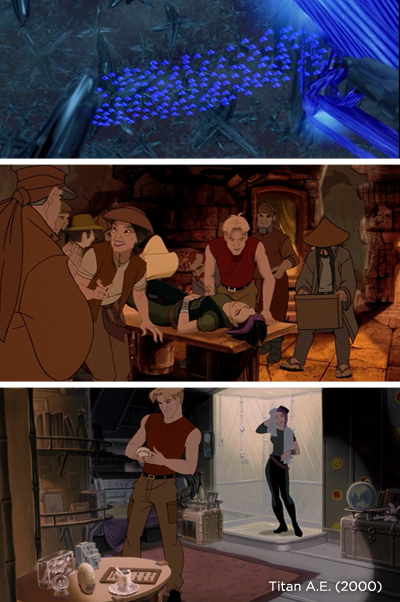 If you haven't watched many 2D animated movies, you might not know that the backgrounds are actually hand-painted. This movie differs a bit by incorporating 3D elements, but most of what you see behind the characters are gorgeous gouache paintings. Want to work on your environment painting skills? Pause the movie and soak in the background .. it's a beautiful environment painting in every shot. Use the inspiration. Consider some of the techniques from the film studies series, and learn from this movie. Mood boards, composition sketches, color palettes... put "Titan A.E" to good use! I almost always leave the movie theater feeling inspired to create, but my schedule stops me from sitting down to paint. If you're able, plan in some extra time directly after watching to sit down and draw or paint. Have fun! Art school is great, but it's not for everyone. Even for those that attend, it's only the beginning of their actual education. Most of the skills I use every day in my art are self taught. Whether it was in my spare time, on the job, or learned from friends: much of my technical knowledge was not learned at art school.This video explores the "making of" Ctrl+Paint to see what skills were necessary to create the site, and where I learned them. Ultimately, we're never prepared for huge projects. Even if you can draw a great still life, art college does not prepare anyone for the challenges of real life. Luckily, you never have to stop learning! Making these videos has been a great experience, and it's probably time to introduce myself. After all, we're 100 videos in. I'm trying my best to sculpt ctrl+Paint in a way that represents my art experience. I've had two major formative experiences: 1) Self-Teaching. All of my software experience has been self taught, and I've never attended a painting class. As a result, I know how hard it can be to learn a new skill without a teacher. 2) Art School. I was lucky enough to attend the Savannah College of Art and Design, which gave me 4 dedicated years of art education. This was a totally different level than taking a few art classes in high school - I was living art. Though art school is absolutely not required, if you can go... it's a lot of fun. Learning to digital paint is a long process. It can seem overwhelming at times, but it gets easier! Trust me! This video will give you a bigger-picture view of the process, and help keep things in perspective. If you want to know more, Learning Map is another good resource. I'm having a blast making these videos for you guys. It's great hearing the interesting conversation, and swapping techniques with all of you artists. That said, I need to keep the lights on here in Ctrl+Paint tower, so you guys need to help spread the word! I hope you've noticed that the website has no advertising, and lost of free videos! None of this is free for me, so another way you can help is by purchasing one of the premium series from the store. Thanks, everyone - and keep being an amazing community!